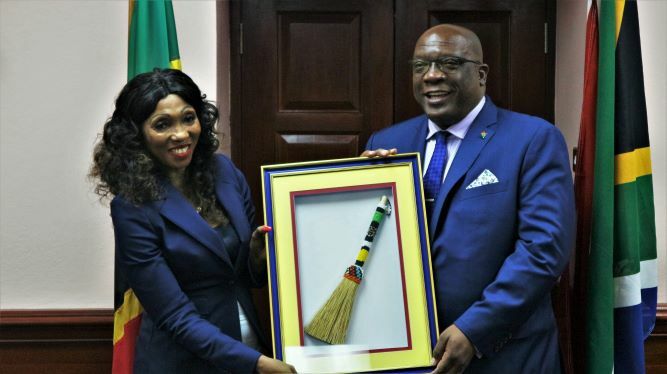 BASSETERRE, St. Kitts, April 08, 2019 (Press Unit in the Office of the Prime Minister) – High Commissioner of the Republic of South Africa to St. Kitts and Nevis, Her Excellency Lumka Yengeni, presented her credentials to the country’s Prime Minister, Dr. the Honourable Timothy Harris, during a courtesy call at the Office of the Prime Minister today, Monday, April 8. High Commissioner Yengeni is one of many foreign dignitaries who is visiting St. Kitts and Nevis to participate in the activities planned for Diplomatic Week2019. In presenting her credentials to the honourable prime minister, High Commissioner Yengeni thanked the Government of St. Kitts and Nevis for its support in a number of areas. “We appreciate your support after apartheid for South Africa. At the United Nations (UN), whenever there is something that is coming up that South Africa needs support for you are always there and so you are an important part for us. We hope that the relationship that we are cementing today it will go a long way, meaning that the two governments will have to look at the areas of cooperation and see where we can strengthen each other,” said High Commissioner Yengeni. High Commissioner Yengeni was one of six visiting diplomats who paid courtesy calls on Prime Minister Harris on Monday.